Nashville Recording Artist Joe Lasher Jr Releases "Jack To Jesus"
On The Horizon artist, Joe Lasher Jr, releases new country music at sold out event. "Jack To Jesus" is a five song e.p. produced by Nashville hit maker, Jeremy Stover and features songs by hit songwriters Jaren Johnston and Chris Janson. On Friday, March 18th, Nashville recording artist and country music rising star, Joe Lasher Jr, releases "Jack To Jesus", a 5 song E.P. produced by hit maker Jeremy Stover, to a sold out show at the iconic Orange Peel, a room that was recently named a top 5 music venue by Rolling Stone Magazine. "Jack to Jesus" is available world wide on iTunes, Amazon, Spotify, Google Play and many other digital outlets. 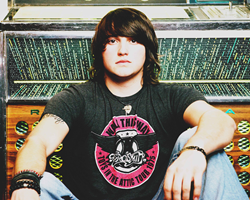 Joe Lasher Jr is a dynamic country artist, songwriter and performer whose songs, style, and performances appeal to a broad spectrum of music lovers. He will captivate an audience with his commanding presence and unique vocal then move them with the impactful and heartfelt delivery of original music and lyrics. His infectious positive attitude and message are proving to be engaging to all audiences. Song after song, show after show, Joe Lasher Jr consistently proves his innate ability to create an emotional connection with an audience by expertly delivering a dynamic performance of well written songs. Joe has performed shows with the likes of Tim McGraw, Rascall Flatts, Cole Swindell, Thomas Rhett, Parmalee, Canaan Smith, LoCash, and Montgomery Gentry to name a few. Lasher is a voice, tone and attitude that make you set down your drink, only to swing around and say, “Damn, who in the heck is that up there?” Knocking on the door of his 20s, Joe is well aware of the hard work and sacrifice needed to one day see his face staring back at him from the bright lights of the marquee, somewhere, anywhere in this crazy, beautiful world.